Drumond Park recently sent us their latest board game Don’t Laugh! to review, as well as the chance to offer one of Sim’s Life visitors the chance to win a copy of the board game for themselves! We love board games in our house, yet sometimes it can get a little frustrating just being the two of us. Though I am pretty sure Don’t Laugh could have kept Liv entertained on her own for hours. The microphone lets off funny noises that actually made her laugh, thus defeating the object of the game when it was her turn! Don’t Laugh is suitable for children aged 8+ with the aim of the game to be not to laugh! Played on a board with up to 4 players or teams of players if you have younger children playing too, simply pick up a joke card when it is your turn from the centre of the board, read it and try to make the other players laugh. This is where a poker face really does come in very handy! Along with the board and cards, the game also comes with the aforementioned microphone that makes random noises that help the main player at the time make the other players laugh. Expect farty noises amongst others! Definitely a game that will get the whole family involved and laughing along easily! Don’t Laugh is another fantastic board game in an already awesome range from Drumond Park. Available from all good retailers. 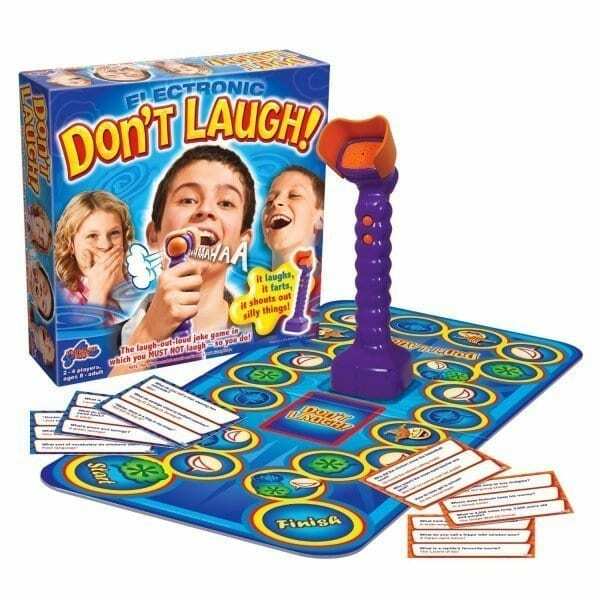 For a chance to win a copy of the Don’t Laugh board game, simply enter the Rafflecopter giveaway below and answer a question with a blog comment! Giveaway ends 28th June 2014 at 11:59PM. The winners will receive a copy of Don’t Laugh. Apart from my kids, as they are always so funny with the things they say or do, Ant and Dec make me laught! I watch all their programmes and I just think they are great entertainment! Being a Geordie too, I grew up with them, and remember watching them in Byker Grove! Tha antics of our Lurcher. My little girl – hilarious! My daughter makes me laugh because she’s such a funny little girl. My dad makes me laugh with his terrible Shakin Stevens impressions. My family and friends – especially my fiance! He is so funny! and silly. My girlfriend always makes me laugh! My kids when they try to tell jokes!!!! Has to be my children actually probs kids in genreal they sure do say the funniest things ..
My kids make me laugh everyday, along with F.R.I.E.N.D.S which is also on in our house every day! the things my 3 year old comes out with! I laugh at everything. People often tell me I would laugh if my bum was on fire ;). I have terrible nervous laugh too ! My middle son has me in hysterics daily, he is 5 and autistic and has such a funny little personality! My daughter, when she does stand up by mimicking people in the house and the comments they make. She is very funny and often makes me laugh so much my sides hurt. Really stupid jokes make me laugh! So does my cat! My kids. They say the funniest things! My little girls laugh makes me laugh! The movie White Chicks, no matter how many times I watch it. An Idiot abroad reminds me of my hubby!! My Ragdoll Cat makes me Laugh He’s such a Character,always chatting to me!! my animals frequently crack me up. Lots of things – children, meerkats, some comedy and being tickled!